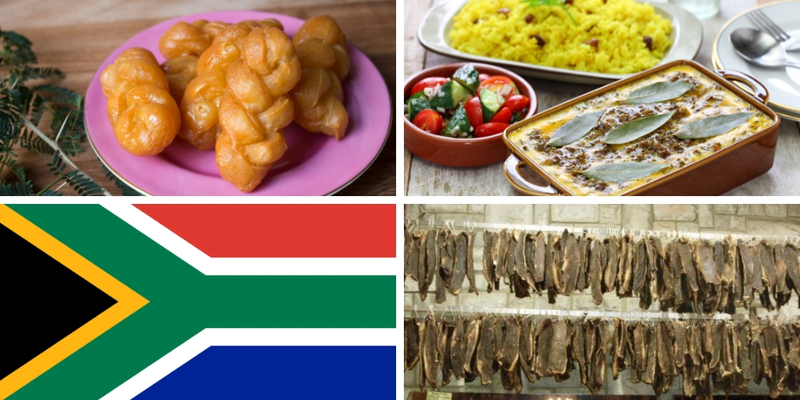 10 South African foods you have to try when you visit! 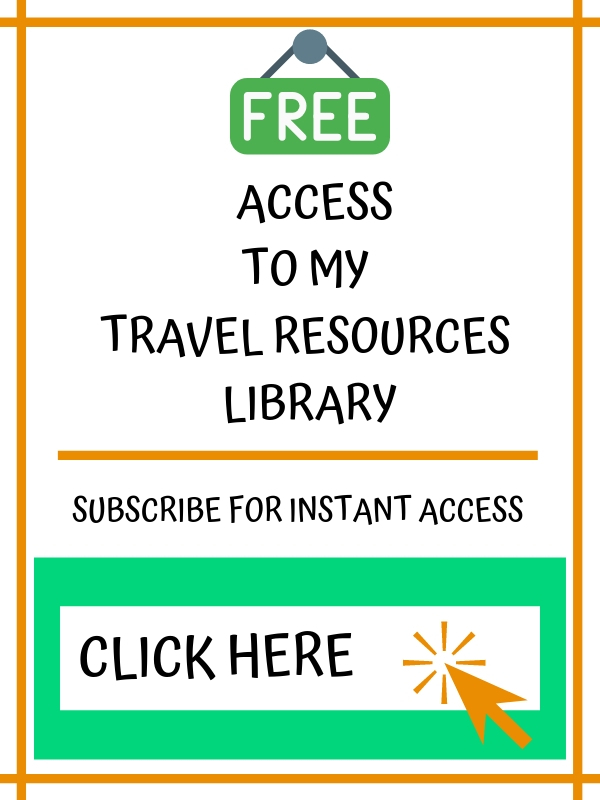 South Africa is one of the most beautiful countries in the world with so many things to offer the visitor – wildlife, beautiful scenery, beaches, mountains, world-class wines and yes wonderful food. It doesn’t matter where I am in the world I always look for a South African shop so I can purchase some of my favourite South African foods. 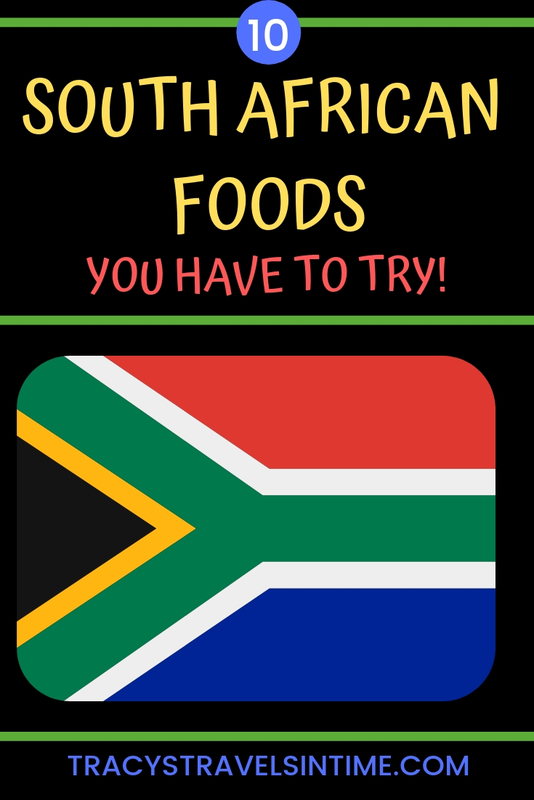 If you are visiting South Africa these are the top foods that I recommend you try when you visit this stunning country! 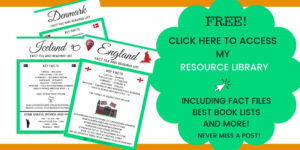 If you like the idea of cooking some of these great dishes check out my recommended cookbooks at the end of the post. 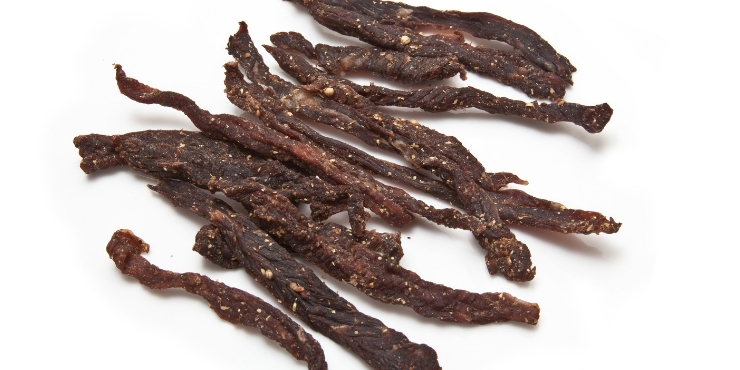 Biltong is dried, cured meat and is a favourite snack of South Africans. It can be made out of a variety of different meats including beef and game. Biltong is produced when vinegar, spices and salt dry and cure the meat. It is low in fat and absolutely delicious! Biltong can also have different spices and flavourings such as chutney, sweet chilli, garlic or peri peri. 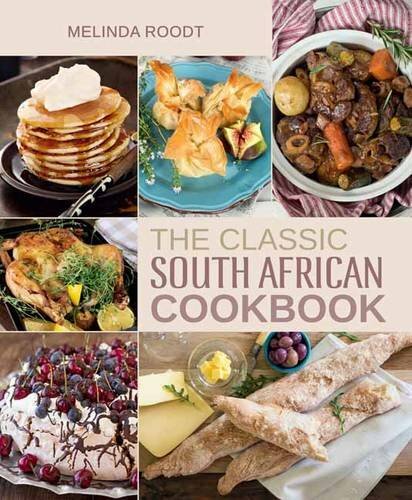 South Africa’s national dish bobotie was Nelson Mandela’s favourite food (and is mine too). This sweet curry is served with rice, chutney coconut and bananas and is delicious. 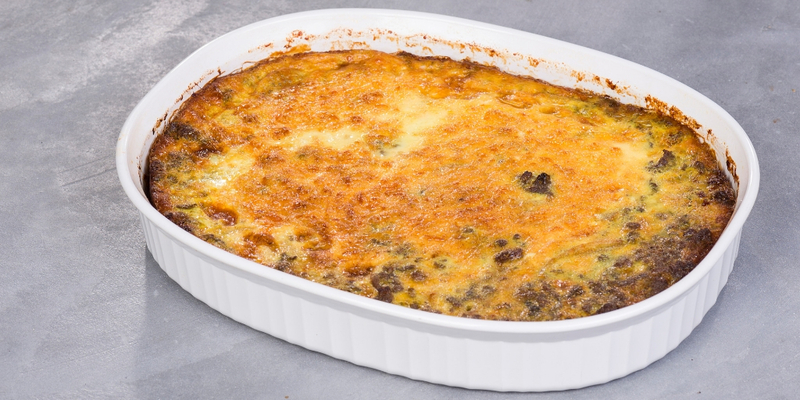 The spiced mince of the dish is topped with an egg and milk mixture before being baked in the oven. 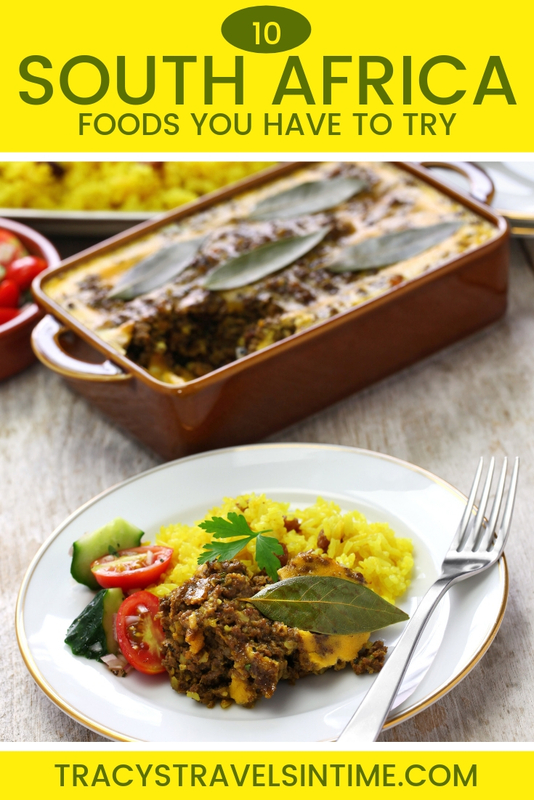 The origins of bobotie lie in the Cape-Malay community who adopted the dish when it arrived in South Africa with the Dutch. 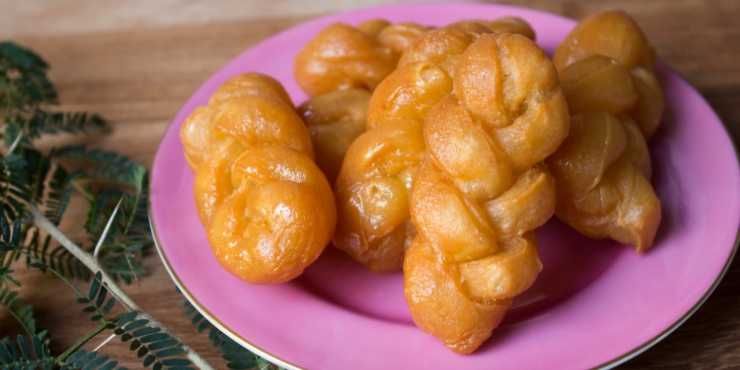 Koeksisters are a traditional Afrikaans pastries made from dough which is fried then infused with honey or syrup. No, not particularly healthy but delicious! Sweet, stick and crunchy I bet you won’t have only one! 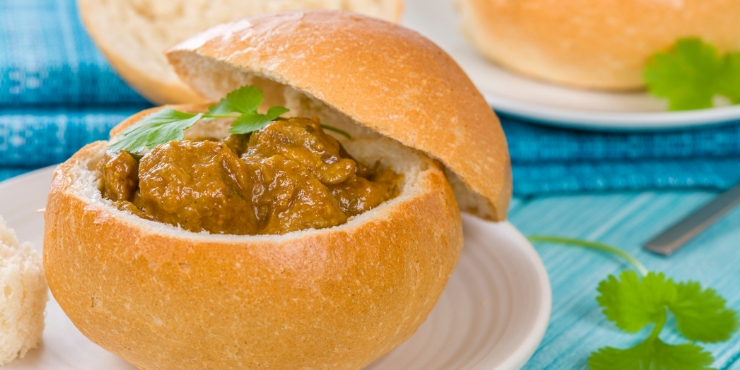 Bunny chow consists of a hollowed out loaf of bread or bun filled with curry. It possibly originated in Durban amongst the Indian sugar plantation workers. Indian shop owners used loaves of bread as take-away containers so the workers could carry their meal to the fields. Although the name suggests the meat used is rabbit the name actually comes from “Bania” who were a caste of Indian merchants who settled in Durban. 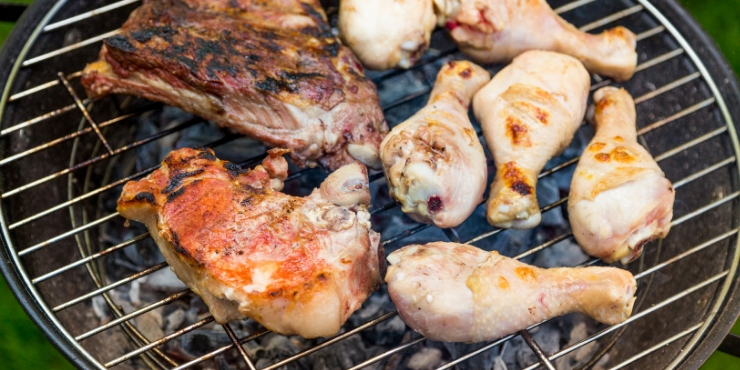 Have a braai – not a BBQ. In South Africa a braai (short for braaivleis) is always cooked over hot coals (not gas!) They can often be busy social events with the men all gathered around the braai with a beer in hand supervising the fire. Deciding when the coals are just right to start cooking is always a matter for debate and god-help the host that starts cooking too soon! 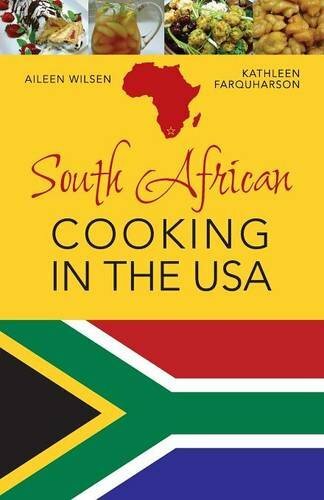 If you are invited to a braai when you are in South Africa I would definitely accept! 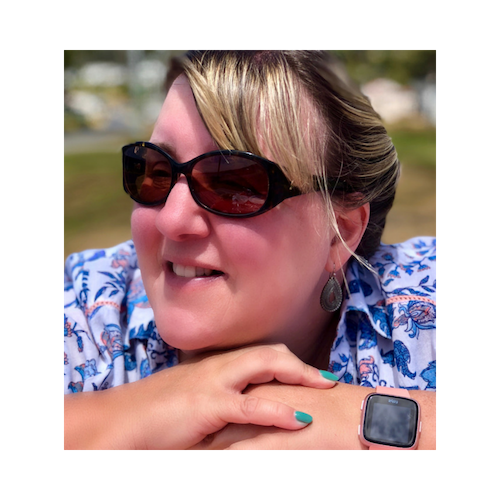 So now you are at the braai and one thing you are SURE to see on there will be some boerewors. Boerewors is a type of sausage which always contains beef and some pork and/or lamb. It consists of pure meat with some added spices. 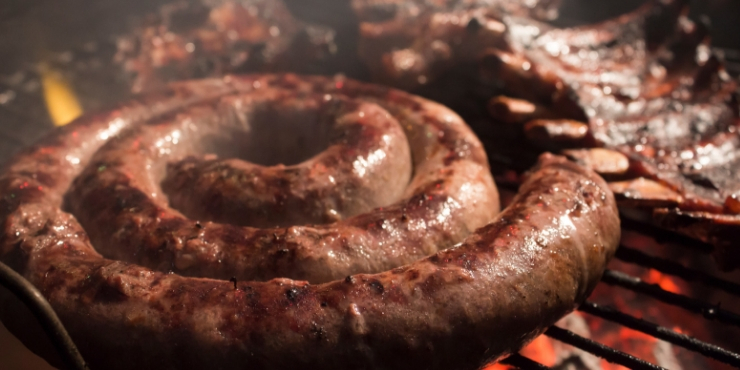 The name boerewors is derived from the Afrikaans words for farmer – boer and sausage – wors. 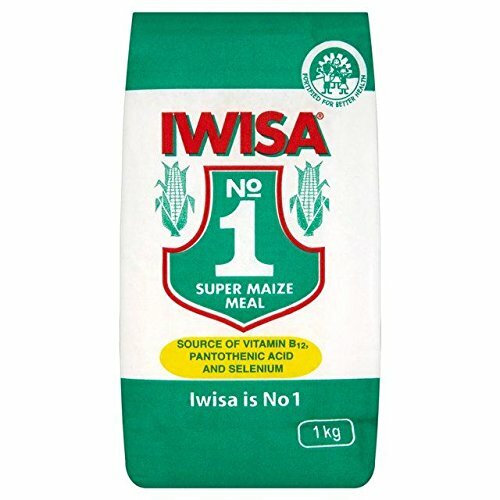 Mealie pap is a traditional porridge made from mielie-meal (ground maize) and is usually served with a tomato and onion relish or gravy or with a stew to soak up the gravy. 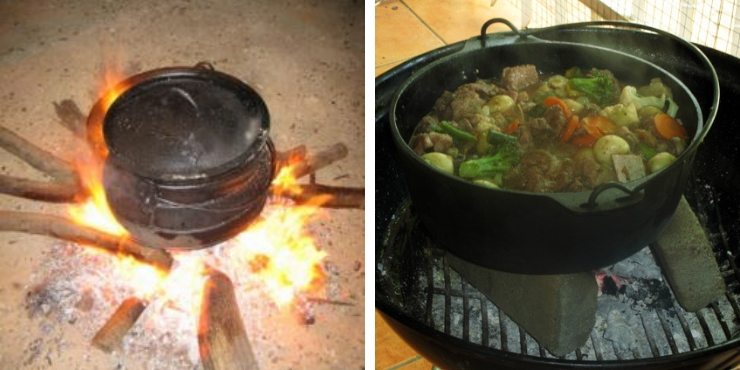 It is the staple meal of most South Africans. 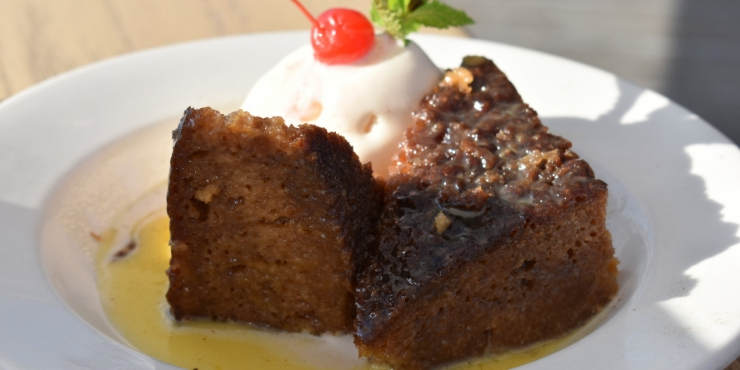 Malva pudding is another sweet treat from South Africa. Once the sponge is baked a buttery sauce is poured over it to make it soft and sticky. The cake is then served hot with custard or cream to produce a moist, sticky, delicious dessert! 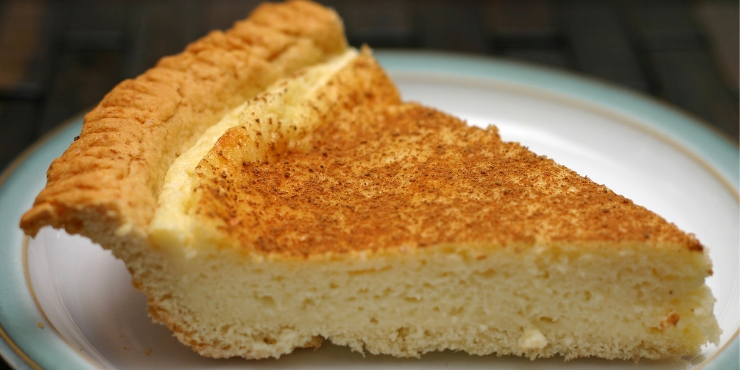 Milk tart is probably South Africa’s most iconic dessert. It is a delicious milk-based custard (with a hint of cinnamon) set in a short-crust pastry. There is some debate about whether it should be baked or set in the fridge but either way it is delicious. Wow Tracy, this post made me so hungry! 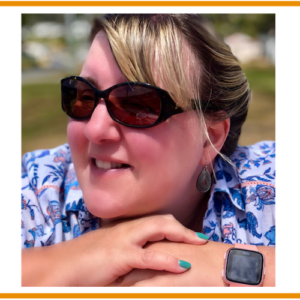 I want to try everything, especially that Milk Tart 🙂 Thank you for sharing all of these wonderful dishes, I’m going to save these to Pinterest and try making them in our kitchen at home.